From cocktail parties to weddings, this Badgley Mischka dress is a perfect fit. With a sleek black bodice and bold blue lace skirt, its look is polished yet romantic. We love it with a strappy black heel. Black and blue lace (100% Polyester). Sleeveless. Halter neckline. Full Skirt. Hidden back zipper with hook-and-eye closure. Fully lined. 40” from shoulder to hemline. Imported. This is a beautiful dress. It was my backup option, but I was really happy with it anyway. The bodice is fitted but not tight- plenty of room for a strapless bra, even if you're full chested. This dress makes the waist look small. 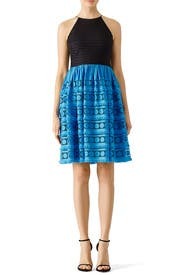 The blue lace on the skirt is a very bright color but it's balanced by the black layer underneath. The skirt is very full. I think this dress would be great on someone with narrow hips. Overall, I got several compliments and was comfortable all night. Rented this for an outdoor party in May. Really well made. I was afraid a 2 might be too tight in the bust, but it worked perfectly. Shows off arms well. I could twirl all day in this dress! The best part about this style is the bottom half. The skirt is so fun and flirty! It runs true to size, and I recommend going up for back up.There is some stretch in the fabric, and it would look great on any body type. There is also plenty of room in the bust, so it will work for any cup size. A strapless bra should be worn. This style is fitted at the natural waist, but there is plenty of room for the hips. 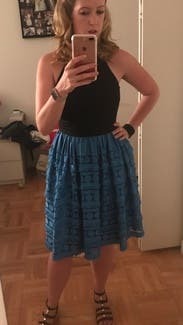 At 5'7, this style is knee length on me. A statement necklace would really make this look pop! Beautiful dress - perfect fit! Lots of compliments! The fit and quality of this dress makes it one of my favorite RTR rentals. The cut of the top is so flattering. I wore a strapless bra, but probably could have gotten away without one b/c the fabric is thick. The blue is vibrant and so fun. Probably wouldn't be great for outdoor heat as the dress is fairly thick. Such a fun dress to wear! I would definitely rent again. Really fun flirty dress. I enjoyed wearing it to a friend's wedding. Runs pretty large. I'm 5'8" and 125 lbs, and I wore a zero. I picked up this dress at the RTR store when another dress I ordered didn't fit. The two size options were a 0 and a 6, and the 0 fit better (although the 2 probably would have been perfect). I would size down one to two sizes, especially if you have a smaller chest. 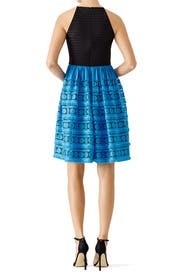 The cerulean blue skirt is even more lovely in person, with a subtle fringe pattern. 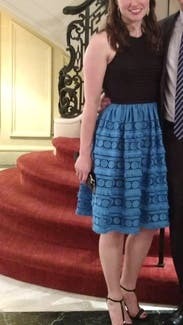 I wore this dress to a wedding welcome party. Great dress! I got tons of compliments. The color of the skirt is amazing, and the texture btw the top and bottom is really interesting. It is not only flattering as well as comfortable. Some of the fringe was a bit smashed when I got it, but not an issue to wear for one evening. 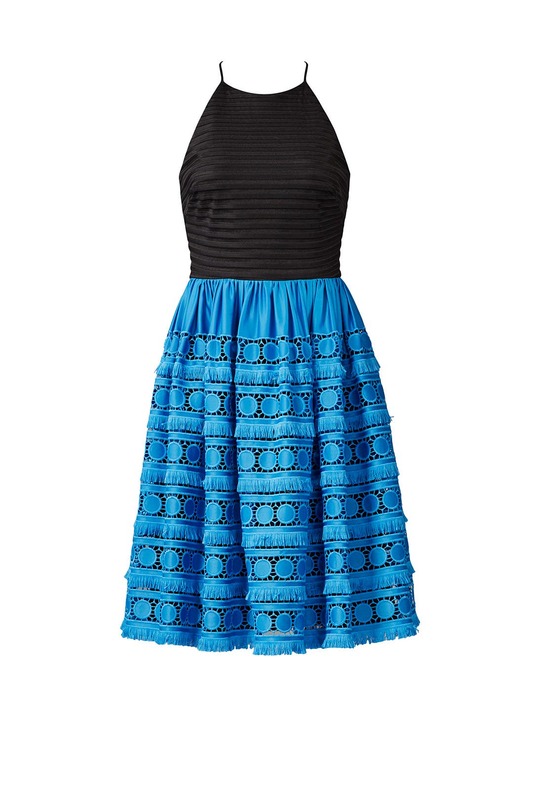 Love this dress—so cute, comfortable, and great to dance in. I normally wear an 8 but the 6 fit perfectly. Wore this to my brother's rehearsal dinner. Beautiful fit, SO comfy. Runs big. I am 2/4 and the zero fit perfectly. Beautiful dress - top runs large. The dress & material is absolutely stunning! It is thick and well made. 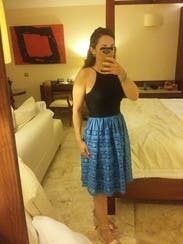 The top is strangely large and unfitted but the waist line has no give - I felt like had I gone a size down the top would have fit much better but the waist would have been too snug. But it was still gorgeous and could go without a bra or with strapless! Flatter figuring black Halter was great but skirt is better than picture reflects. The fabric is a shiny patterned Lacey silk with interwoven blue circles and fringe. Bright fun and perfect for a wedding, summer party. Could be formal or casual with different shoes. Loved this. Amazing rental. 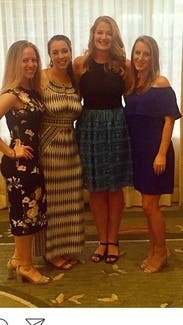 For a couple of months, I carefully reviewed the dresses on RTR (using the APP). Each one I liked, I pressed the HEART and saved it to "Wedding July." Then, 6 weeks before, I placed my order for my #1 Choice. It arrived as scheduled along with the lovely purse and earrings.... It was just as the pictures appeared. There was a slight challenge with the underlining. I called RTR ( less than 48 hours b4 we had to leave for the wedding) AND, my #2 Choice was available in the size(s) needed! (Always have a backup selection!) 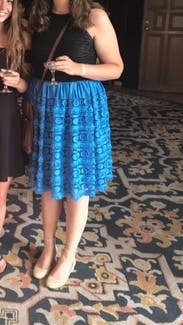 I am wearing that dress in the picture - it is a Size 10, but I should have worn the Size 8 (my backup Size). I am 5'/36DD..... Nonetheless, it was beautiful! Compliments abound! I did wear a strapless bra which is highly suggested, extremely comfortable for an evening Wedding Reception! I knew the wedding was going to be spectacular, so I wanted to compliment that occasion! I was the most classy woman (aside from the Bride, of course), per my husband! 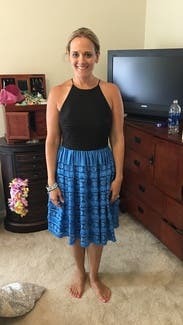 LOL The existence of RTR is fabulous because it gives women the opportunity to wear a dress she may not want or be able to purchase, along with accessories! I am a life long customer for any special occasion in my future! 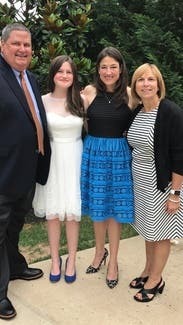 Thank you RTR and to my daughter-in-law who brought my attention to RTR as she wore a gorgeous dress to a wedding several months ago! Happy Customer! 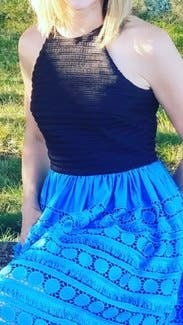 Loved the swing in the skirt and the bright blue. 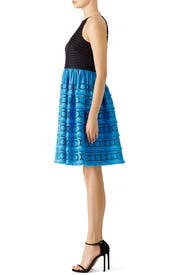 The skirt design made a simple dress a pop of color and fun! Was comfortable all night and got lots of compliments. Would definitely rent again! 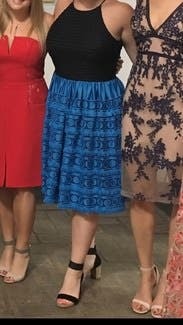 Loved the pockets and comfort in this dress! It was also long enough for a tall lady! This dress fit great! Quality material! I liked the combination of black and a strong bright blue. I was able to wear many of the black shoes in my closet to complete the look. I agree with others who said the top ran a bit large. 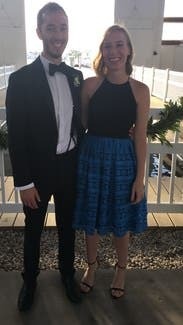 Great dress for a great night! Though I tried it on, it made me look bigger in the waste, so I decided not to wear it. Fun dress, great colors and great fabric. This fit me true to size and was comfortable to wear, as well as fun and very pretty. The upper half of the dress did rise up a bit whenever I sat down, but it wasn't a major problem. 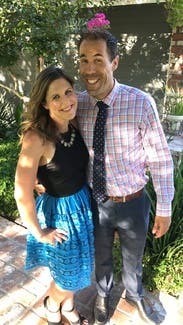 This dress was a great compromise for a wedding that was officially black tie (men in tuxes) but more casual in spirit. I usually wear a 0-4, but I wore a 0 in this one. I'm very small up too, and it fitted nicely. (Might not be so accommodating for all sizes. I'm 5'4", and it hit me right at the knee. Very comfortable for dancing and wearing long into the evening. Jet-beaded black earrings, simple black sandals, and a tiny clutch finished it off nicely. Perfect for a beautiful dinner in Costa Rica! 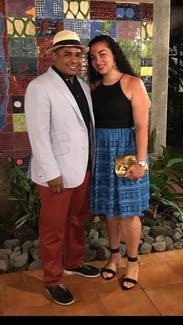 Wore this for a private dinner in the amazon in Costa Rica. Not one I would have chosen on but own but the stylist at the store brought it out for me and it was perfect for that evening. The fit is amazing and it's such a fun dress. Amazing dress! 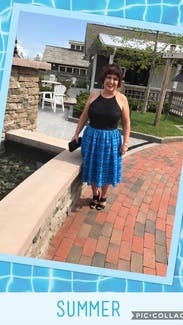 Wore this dress vineyard hopping on a warm day and it was PERFECT! 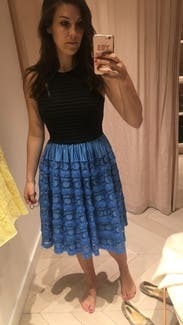 I may buy this dress! Compliments everywhere I went. The color contrast and style cannot be beat. Only downside... can't really where with a sweater because it took away from the dress! Loved this dress! Wore to a tropical destination wedding. It was comfortable, cute, pop of color and packed well. Skirt is fun for a night of dancing. I rented this to wear to a baby shower but the top fit strange and I didn't end up wearing it. I have a big chest and the fabric made me look even bigger.